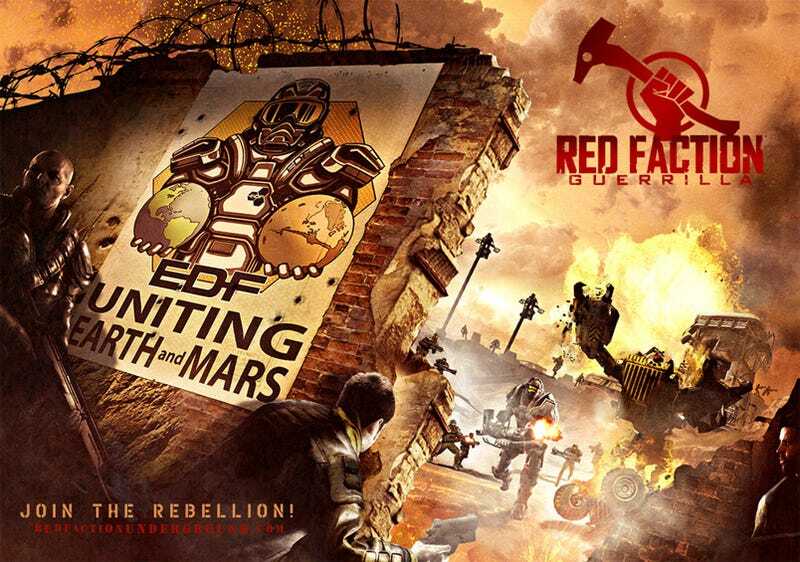 The free citizens of Mars rise up against their Earth Defense Force oppressors in Red Faction: Guerrilla, taking the destruction of the first two titles to all-new heights. Things have taken a turn for the worse since the ending of the first Red Faction game, which saw the Earth Defense Force arrive to aid Martian settlers escape the oppression of the villainous Ultor Corporation. As the saying goes, here's the new boss - same as the old boss. Now it's the Earth Defense Force themselves doing the oppressing, and it's up to Alec Mason and the Red Faction to restore freedom to the people of Mars, one sector at a time. Taking full advantage of the latest console technology, Volition has taken the destructibility the first two Red Faction titles and amplified it exponentially. Have they crafted a smashing success? The language and iconography is surely too specific to be an accident. This is Iraqi Insurgency: The Videogame, by any other name, and you're playing as the terrorists. Despite the fading influence of Dubya's era of flag-waving good-vs-evil jingoism, it's still an incredibly bold (some might say stupid) parallel to incorporate into a major videogame, even if the story never really develops this timely theme into anything deeper than the old truism that one man's freedom fighter is another man's terrorist. The beauty of Red Faction: Guerrilla is that every set piece is of your own making. The game has no linear structure because the goal in every area is the same: clear the region of EDF control. This is represented by a bar that drops every time you wipe out a key EDF building or complete a side mission. Here's the fun bit, though: you don't have to do any of the game's weak sub-missions, such as saving hostages – this is almost impossible, due to weak ally AI – or driving a vehicle from one side of the map to the other within a set time limit. Instead, Alec can just raid any area marked with red on the map, then blow it to kingdom come with a combination of stupidly overpowered tools. The magic behind Guerrilla's bangs is a true physics-based destruction system, which sees individual bricks and support beams dynamically falling to the might of your weighty sledge hammer. It looks impressive and feels all the more satisfying; ploughing a truck through a load-bearing corner of a three-story building will send brick and mortar collapsing to the ground - and crushing whoever might be loitering underneath it. It's instantly gratifying and lots of fun. You'll probably spend the first few hours of Red Faction knocking things down just to watch them fall, which is a pretty good proof of concept if we've ever seen one. Whereas the single-player campaign is slightly flawed, but good fun, Guerrilla's multiplayer offering is really quite superb. Volition has taken advantage of the game's key asset, its destruction, and built the various multiplayer modes around it. The most basic is Wrecking Crew, a four-player local play game mode selectable from the main menu. Here you take turns trying to cause as much damage as possible within the constraints decided on at the outset. This might mean limiting the ammo supply and giving you three minutes to plan a careful assault, or simply being handed a mega-powerful explosive-rocket launcher and letting loose for one minute. It's great fun and results in some truly staggering moments of next-gen physics. Red Faction: Guerrilla is an in your face, balls to the wall, destroy everything in your path treat. With a ton of missions to complete, an entire planet to destroy, and online modes that will have you sitting in front of your television for hours upon hours, this game has it all. I know this has been said a ton of times before, but it holds true for this game; if Red Faction: Guerrilla doesn't get your blood pumping, check your pulse. Red Faction: Guerrilla should not be overlooked by anyone, period. Red Faction: Guerrilla is a moment generator. The destruction, the physics, the teeming population all combine to create moments you're going to have to tell your friends about. For me, it was when I finally took down that six-lane bridge. It took quite a bit of effort and lots of planning. Once it collapsed, dust billowed into the air, clouding the entire screen. Seconds later, standing under the jagged remains of the bridge, I saw cars that had been moments ago speeding down a highway begin plummeting off into the wreckage, piling on one another until they all exploded. It was amazing.